You know that gamertag you've been sporting the past few years, the one with the letters replaced with numbers because someone else had the same name idea first? You should change it now, while it's cheap. This week's Deal of the Week on Xbox Live is the ability to change your gamertag for only 560 Microsoft points, 240 points off the normal price. That's a savings of three dollars, all in the name of changing the name everyone on Xbox Live knows you by. Normally Microsoft uses its Deal of the Week to discount downloadable content or Xbox Live Arcade games. Your gamertag must be especially hideous for them to dedicate this week's sale to getting it changed. 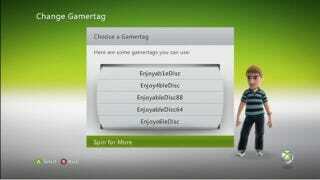 Hit up the link below for instructions on how to get an awesome new gamertag. Just don't expect to get anything as cool and hip as 'F4hey', because that's already taken.